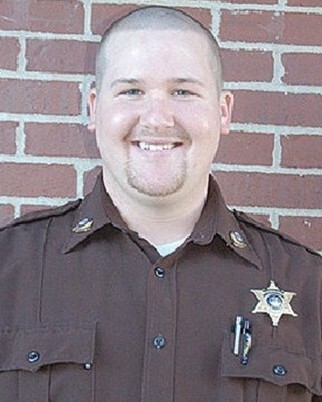 I can only hope that the driver of the car is held accountable for this Deputy Sheriff's death as well. God Bless and Godspeed, sir. You will be missed. My prayers are with the family and friends of Deputy Chism. Your loss is so overwhelming. When we received the phone call that you had been shot, Leon rushed to be by your side. I waited for his call to say that you were o.k. But I did not receive the news I desperately wanted to hear. Leon & I and the entire department is devastated by your loss. Leon was so very proud of you. Your eager ambition, always willing to kick in a few doors, never shirking your duties. Always doing your best with great pride. I always enjoyed visiting with you at the office or when you stopped by our house. Every time I asked, "How's your boy?" You would proudly open your phone and show me his picture. You were such a proud daddy. Our hearts ache for Ashley, Hunter, your mom, dad, Josh, your grandma and grandpa and your many family members that I have known most of my life. But don't worry, Ashley & Hunter will always be a part of CCSO family. We will always be there for them, we will keep them safe and close. After all, us cop's wives have to stick together through no matter what life brings us. Matt, I'm so thankful I've had the privilege to have know you, since you were a little bitty squirt. You were a great kid that grew into a fine upstanding officer. Your dad told us the reason why you wanted to become a cop. Because of your 5th grade D.A.R.E. teacher. That you had so much respect for Leon that you wanted to grow up and be just like him. Wow, we had no words, just lots of tears. You became what you wanted to become, and your former D.A.R.E. teacher and now Sheriff became your boss, whom was so proud of you (even when you kicked in the wrong door). You will be forever missed and never forgotten. You made the ultimate sacrifice, but better yet you went above and beyond the call of duty, you eliminated your killer. The law enforcement community is truly sadden by the untimely passing of Deputy Sheriff Matthew Chism. Our deepest sympathies and prayers go to the family, friends, and coworkers of Deputy Chism. We would also like to thank him for his service. May his soul rest in peace. We have your back and the watch now. God bless you and your family. R.I.P. LaGarda Security Services, Flint, MI. Protect us from the heavens brother. To Matthew's family, fellow officers, and all who call Matthew beloved, my heart goes out to all of you and may you find comfort in your loved ones and your strength in your faith. When my son was killed, the entire law enforcement community in our area embraced us in a circle of love and support, and I know you will receive the same support. It makes the unbearable less torturous, and I pray for your solace. This reflection is sent with the utmost respect for the dedicated service Deputy Chism gave to his community and the citizens of Missouri , and for the supreme sacrifice he and his family made on November 2, 2014. Our thoughts and prayers to the family and co-workers of Deputy Chism. Rest in peace brother, we will take it from here. God Bless You, Your Family, & Friends. Rest in Peace. R.I.P. Deputy Chism, we're keeping you, your family and all our brothers and sisters with the Cedar County Sheriff's Office in our thoughts and prayers. May God bless you my brother, and may God keep you in his loving care as we remain " Standing Tall For Those Who Have Fallen "
Thanks for your service is never enough! For your ultimate sacrifice, Thank You Sir!!! May God send Angels to watch over your wife and child in this time of grief! May God also send Angels to his Brothers to help ease their pain and loss! Rest easy brother may god be by your side. We are all able to enjoy a reasonably peaceful life because dedicated a officers such as Matthew Chism are prepared to got out and contend with the dark side of society and keep it from our doors. The men and women who form the "thin blue line" deserve our respect and admiration. As I attended the funeral of our departments fallen officer today and prepare for another funeral for a Placer County Sheriff's Deputy tomorrow, I find we have lost yet another fine warrior. Rest in peace my brother. My thoughts and prayers are with your loved ones and the men and women in blue on your department. You are a true hero. Prayers are sent to your family, friends and co-workers. It has been 10 years since my brother was taken. He worked in St. Louis City, MO. I know there are no words that will help right now but please take comfort in knowing so many people are here for you. Just take one day at a time. The Fordland Police Department would like to extend our deepest sympathy to the family of Deputy Matthew Chism. We are more than positive that he will be missed by all he had relations with. Rest in peace Deputy Chism your brothers will take it from here. Thank you. I'm proud of you, Matt, and so blessed to have known you. My thoughts and prayers to the family, friends and co-workers of Deputy Matthew Chism. Another Hero taken too soon. May God comfort you and your family as you go and touch the face of God. Your honorable service and sacrifice and bravery to the citizens of Cedar County, Missouri will not be forgotten. God Speed and God Bless. Rest in Peace Sir. May the child of Deputy Chism know that their Dad is a HERO who we will not forget and will forever be in his debt for all he has done for us, Deputy Chism, Thank You for your service and protection to us all, may you rest in peace God bless you and your family. There is no greater sacrifice. We will honor your life everyday, by serving our communities and keeping people safe. You served your state with honor and pride. Godspeed brother. Rest easy Matt; thank you for your sacrifice. Take comfort in that your family is being blessed with an outpour of community support. God Bless you Matt. May the peace of God comfort the family both his immediate and the law enforcement family. Time is what it will take.